Ashley Flynn, an NCHA Hall of Fame Non-Pro rider with earnings of $628,515, collected $10,000 and her second Southern Futurity Non-Pro Derby championship win with 222 points on Friday, aboard Smooth Lines, by Smooth As A Cat. Flynn had also won the 2012 edition of the event riding Checks For Sure, by Im Countin Checks. Nadine Payne, Overbrook, Okla., and Madalyn Colgrove, Boligee, Miss., tied with 218 points as reserve champions. Payne was riding her 2017 Southern Futurity champion Peaceful Ez Feelin, by Lizzys Gotta Player, and Colgrove was on X Marks The Spot, by Woody Be Tuff. Ashley Flynn, Weatherford, Tex., has won over 16 major limited age events. She was 2015 NCHA Futurity Non-Pro reserve champion on LHR Smooth James Rey, and placed third on Financial Sugar in the 2008 Millionheir Classic Non-Pro, where Flynn earned $36,000, her single richest check. Madalyn Colgrove, the earner of $581,937, showed X Marks The Spot to place seventh in the West Texas Non-Pro Derby this summer. She also showed Sweet Baby Marie, by High Brow CD, earlier this year to win the Cattlemen’s Derby Classic Non-Pro. Sweet Baby Marie also carried Colgrove to reserve non-pro championships in the 2017 NCHA Derby and the 2017 Breeders Invitational. 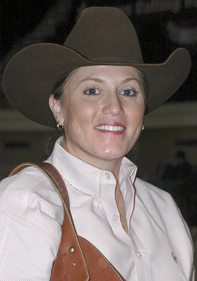 Nadine Payne, an NCHA Hall of Fame Non-Pro with earnings of $526,756, also won the 2018 Southern Futurity Non-Pro on Saturday riding Desires A Gun, by Boon Too Suen. In addition, Payne won the 2017 Southern Futurity Non-Pro on Peaceful EZ Feeling, who she also showed to win the 2017 Brazos Bash Futurity Non-Pro. Payne’s top wins came in 2014, when she claimed the NCHA Futurity Non-Pro championship with Great Expectations, by Third Cutting, and in 2016, when she won the NCHA Super Stakes Non-Pro on Velvets Revolver, by WR This Cats Smart. In the Southern 5/6 Non-Pro Classic, Bill Cowan, Ardmore, Okla., an NCHA Hall of Fame Non-Pro rider with earnings of $868,772, scored 220 points for the win on 6-year-old Shes Full Of Hope, by Smart Mate. Kolby Don Moore, Crawfordsville, Fla., scored 218 points aboard 5-year-old Highbrow Nadine, by High Brow CD, for the reserve championship, while Lica Pinkston, Alice, Tex., placed third with 214 points on 5-year-old Stylish Top Brow, by High Brow CD. Cowan, also placed seventh in the Southern Derby Non-Pro with Catty Minx, the horse he showed last month to win the El Rancho Futurity 4-Year-Old Non-Pro. In addition, Cowan won the 2018 El Rancho Classic with Catty Bluz, a full brother to Catty Minx, by Cowan Ranch stallion Catty Hawk, who Cowan showed as 2008 NCHA Futurity Non-Pro Limited champion. Kolby Don Moore, the NCHA earner of $85,000, showed Highbrow Nadine earlier this year to place sixth in the NCHA Classic Challenge Non-Pro, as well as fourth in the NCHA Eastern National Championships Non-Pro. Lica Pinkston, the NCHA earner of $370,000, claimed the 2018 Breeders Invitational Amateur Classic reserve championship with Stylish Top Brow and fifth placed with the gelding in the NCHA Super Stakes Classic Amateur, as well as seventh in the 2018 Cotton Stakes Amateur. Pinkston and Stylish Top Brow also won the 2017 Southern Futurity 4-Year-Old Amateur Unlimited and the 2017 West Texas Futurity 4-Year-Old Amateur Unlimited. The 2018 Southern 3-Year-Old Futurity final results were determined by a cumulative two go-round score. Nadine Payne was the winner with 429 points on Desires A Gun, reserve champion of the Southern Open Futurity with Nadine’s husband, James Payne, who won the 2018 Southern Futurity Open riding Stylish Hailee. Nadine Payne and Desires A Gun also won the 2018 West Texas Futurity Non-Pro. Sasha Thompson, Buffalo, Tex., the NCHA earner of $230,408, scored 428 points to place second riding homebred My My Sharoana, by One Roan Peptos. Sasha won the 2017 Southern Futurity Classic Non-Pro riding Sho Nuff Hot, by Spots Hot, and placed third in the Augusta Futurity Non-Pro on Thommo, by Thomas E Hughes. Both Sho Nuff Hot and Thommo, were bred by Sasha and her husband Craig out of Miss Play Reyco, by Playgun, the mare who carried Sasha to win the 2010 Tunica Futurity Classic Non-Pro and place third in the Southern Futurity Classic Non-Pro. Jessica Pierce, Noxapater, Miss., the NCHA earner of $209,371, scored 427.5 points to place third aboard the Hottish mare Hott Pockets, who Bill Pierce showed to place third in the Futurity Open. The 2018 Southern Futurity in Jackson, Miss., concluded on Saturday with the 3-Year-Old Non-Pro Finals, as well as the Amateur and Amateur Unlimited Finals. For complete results go to 2018 Southern Futurity.